In 2014 Balmoral introduced their flagship cigar Añejo 18, which was an impressive success globally. The cigar was rated with 93 points by Cigar Journal, collected 5 cigar rings in the French magazine L’Amateur de Cigare (Cigarscope) and claimed a 12th position in the Cigar Journal top 25 of best cigars from the Dominican Republic. It has been a wonderful year for Balmoral. The rare 18--‐year old Arapiraca wrapper is very limited and to continue the success of Añejo, which in fact is based on aged tobaccos, Balmoral now introduces its successor Balmoral Añejo XO. Only this Balmoral Añejo XO can compete with the Añejo 18. All tobaccos used have been thoroughly aged and create a sophisticated and complex aroma that is said to be beyond compare. Medium to full bodied, Royal Agio Cigars describes the Añejo XO’s taste as an explosion of aroma’s and complexity, with notes of cedar wood, spices, cacao and an underlying sweetness. Wintermans is convinced that the XO rivals the Añejo 18’s taste for complexity and subtlety and even ads a bit of extra sweetness and creaminess. The Añejo XO will come in three ´vitolas´. Next to the already existing models, Rothschild Masivo (MSRP $9.90) and the torpedo shaped Mk52 (MSRP $10.95), a Petit Robusto FT (MSRP $8.50) will be added to the Añejo range. FT, short for Flag Tail, comes recommended as the short smoke alternative for the Rothschild Masivo and the Mk52. This Petit Robusto FT has a ring gauge of 48 and carries a lower price than its brothers, making the Añejo taste accessible to a wider audience. 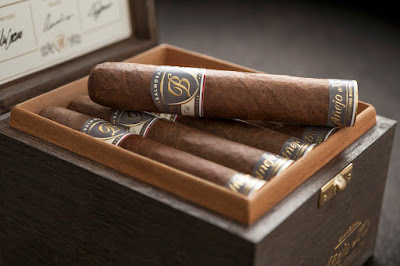 Such splendid cigars should be treasured, and in that spirit Balmoral designed a grey box that matches the Añejo XO cigars in both quality and style. Balmoral’s partner Drew Estate has again selected a very limited number of premium retailers to introduce the Balmoral Añejo XO. All three vitolas are available now at Drew Estate Diplomat stores. To learn more about the new Balmoral Añejo XO products and all of Drew Estate’s IPCPR releases, visit http://drewestate.com/ipcpr.